US travelers made 2.3 million trips to China during the first 11 months of 2018, which means 70 out of 10,000 people in the US traveled to China during the period, Lu Kang, a spokesperson for the Chinese Foreign Ministry, told a Friday press briefing. 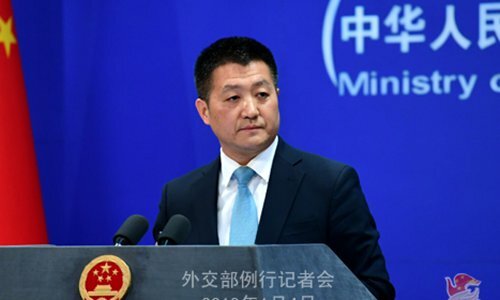 China's Foreign Ministry responded strongly to the US travel warning on China by saying that Washington has often set obstacles in the path of Chinese nationals traveling to the US, not the other way around. The number far exceeds people who traveled from China to the US, which is the best proof to show whether China is safe or not, said Lu, noting he hopes the US can do something to boost two peoples' mutual trust, not the contrary. His comments came after the US State Department on Thursday updated its travel warning about China, urging Americans to "exercise increased caution" in the country "due to arbitrary enforcement of local laws as well as special restrictions on dual US-Chinese nationals." It said that China uses exit bans coercively "to compel US citizens to participate in Chinese government investigations, to lure individuals back to China from abroad, and to aid Chinese authorities in resolving civil disputes in favor of Chinese parties." China welcomes foreign citizens, including US citizens to visit, and will protect their safety, legal rights and freedom of entry and exit from the country, said Lu, noting that at the same time, China hopes foreigners can respect and obey Chinese law. Chinese authorities will deal with foreign citizens who commit crime in China according to the law, and meanwhile still protect their legal rights, Lu said. The US action is very "absurd" to some extent, because it aims to add to tensions when Sino-US relations are at a critical juncture, Shi Yinhong, director of Renmin University of China's Center for American Studies, told the Global Times on Friday. He noted that China has never arrested any law-abiding US national. Some US media outlets are also hyping up the possibility of US executives being detained in China after Huawei CFO Meng Wanzhou's arrest in Canada at the behest of the US. However, the allegation was slammed by Apple CEO Tim Cook who said he wasn't worried about traveling to China and felt welcomed by the country. The US, on the other hand, passed the Reciprocal Access to Tibet Act of 2018 in December, which is purportedly designed to promote access for US diplomats, officials, journalists and others from the US to Tibet and Tibetan autonomous prefectures in Sichuan, Qinghai, Yunnan and Gansu provinces.